Honey is so smart and eager to please. She is currently 16 months old but by the time she had reached 1 year I had taught her a combination of words/tricks/commands totaling 54. There's nothing she won't try to do to please me if it's in her abilities and she understands what I want. I love her so much and so do the folks at the assisted living facility that she visits as well as my son's elementary school. At the school she listens quietly while the children read her a story and as a reward for their efforts the children get to give Honey commands for some of her tricks. She is truly loved and entertained by people everywhere she goes. She's been therapy for me when my heart was torn and now she is the ultimate therapy dog and entertainer wherever she goes. I thank God for Blessing Me with her. 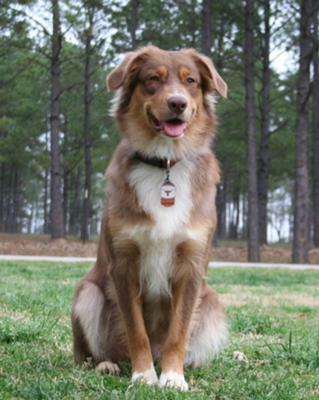 Comments for Honey The Awesome Aussie! she's absolutely gorgeous! i love her smily face, she just looks so happy and content! aussies are just the best!